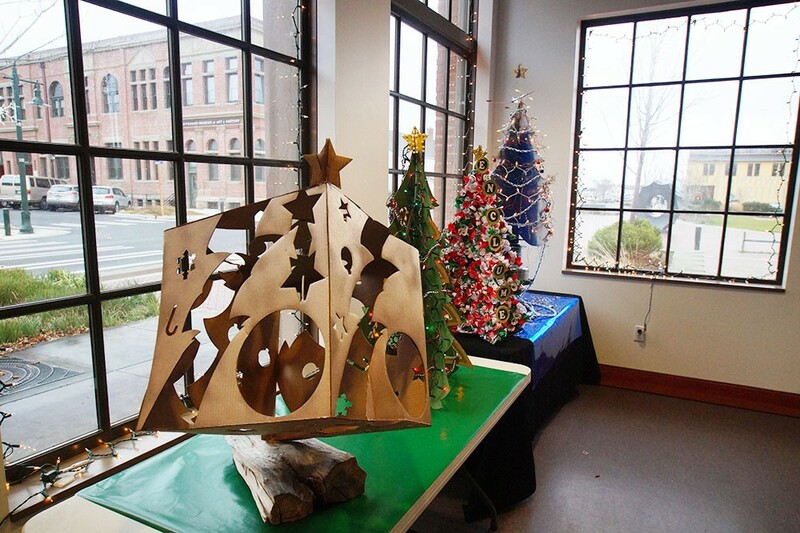 Again, this year for Christmas, Port Townsend Paper Corporation employees will hand out three-foot-high, three-dimensional Christmas trees made of Port Townsend Kraft paper and ask the locals to start decorating. From November 18 – Dec 7th, pick up your (free) Kraft tree and a copy of the contest rules at the following locations: Aldrich’s, the Chamber of Commerce Visitor’s Center, Henery’s Hardware, or Hadlock Building Supply. Trees can be decorated with whatever materials the owners saw fit—markers, paint, feathers, glitter, found objects—anything and everything is fair game. After the tree trimming is complete, the artists can then take a picture of their decorated tree and submit it to the PTPC Kraft Christmas Contest. The contest is open to participants in a variety of categories–Kids and Teens, Best-In-Show 18+, Seniors, Businesses, Nonprofits and Agencies—competing for cash prizes, shiny plaques and bragging rights. We also have a category for school groups. Winners in each category will be selected by our panel of judges, including Mill Manager Carr Tyndall. All the amazing entries will be on display on our Facebook page after December 8th when the winners are announced. Thank you so much to everyone who participates. We can’t wait to see what you come up with each year!